Excellent traction, braking, performance & cornering ability in the wet. Excellent performance on dry surfaces. Adapts to all road surfaces in all weather conditions. 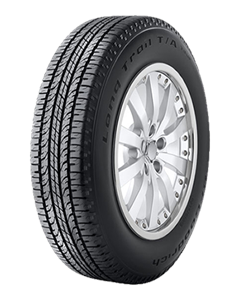 On asphalt or off the beaten track, the Radial Long Trail T/A Tour tyre makes it possible to drive on various types of terrain. Two metallic bracing plies reinforce the tread area. Asymmetric tread pattern with sculpted inner shoulders. Sorry, we currently do not have any tyres with the Long Trail T/A Tour pattern in stock.